The raccoons are out of control. They've diversified into many different forms, morphing into all manner of styles. 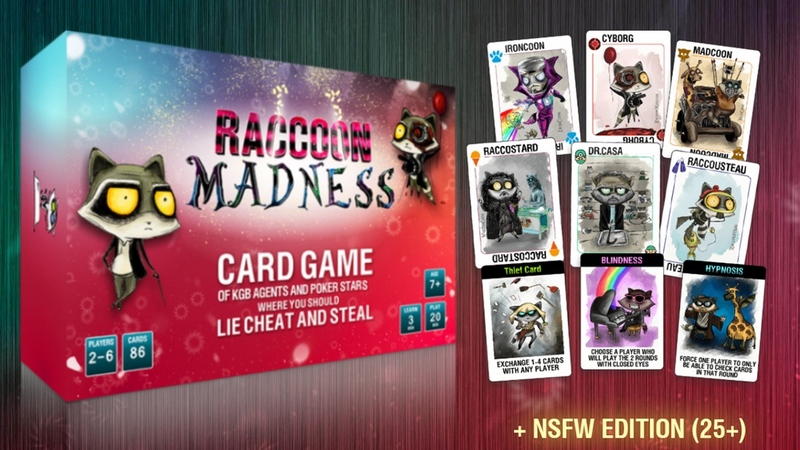 In Raccoon Madness, you'll have to be good at bluffing in order to get rid of your cards. Will another player call your bluff? The game is up on Kickstarter now. This game was created by three friends. We have been inspired by Tim Burtons art, old USSR game and Texas Holdem Poker. Every day we have to decide whether to tell the truth or to tell a lie; sometimes we are afraid of being deceived and we feel ashamed whenever we are caught in a lie. To train our intuition and to enhance our emotion reading skills in a fun environment, have created “Raccoon Madness Game”. The campaign is very close to its funding goal with still 29 days left to go.